A fire in a national park in the state of Goiás, in central Brazil, has destroyed more than 25% of it's protected area. Forest fires in Brazil’s Chapada dos Veadeiros National Park, a Unesco World Heritage site, have finally subsided due to recent rainfall and relentless efforts by firefighters to contain the blaze, park officials announced on Sunday. “In many places the fires have subsided. 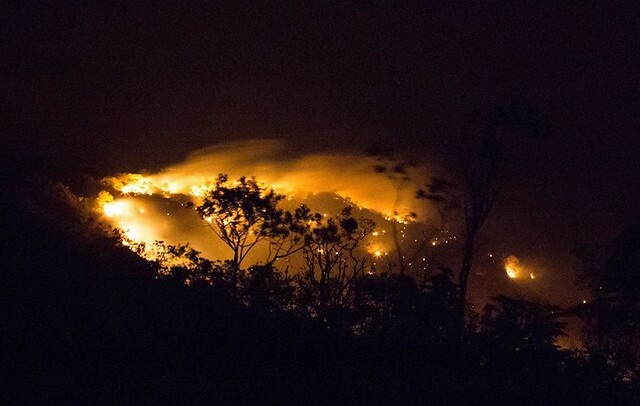 However, we will continue to monitor the situation and combat the fires until they are fully contained and extinguished,” Fernando Tatagiba, Director of the Chapada dos Veadeiros National Park told Agência Brasil on Sunday. Park officials estimate that the fire, which began in mid-October, has charred more than 65,000 hectares of forest, which is roughly equal to 27 percent of the park. The wildlife park is home to a variety of native, endangered species, such as the maned wolf, jaguar, giant anteaters, giant armadillos and Brazil’s endemic merganser duck. The park protects about 400 species of vascular plants per hectare and boasts a myriad of high waterfalls. In June, the government increased the park's size from 65,000 to 240,000 hectares, a move that was applauded by environmentalists. However, the park's director reissued his suspicions that the fire was the result of arson but pointed out that authorities are still in the process of carrying out their investigation. “We have strong evidence that suggest that fire did not happen due to natural causes. Most of the evidence indicates that the fire was due to human activity,” Tatagiba told Agência Brasil. This is one of the worst fires the park has suffered since it was established in 1961. Brazil’s forests have been suffering a slew of few major fires recently. In October, fire damage was detected in the neighboring states of Goiás, Tocantins and Bahia. Officials have witnessed a sharp increase in forest fire outbreaks. During the first 27 days of September, the National Institute of Space Research (INPE) observed a total 105,000 forest fire outbreaks, which marks the highest total since the agency first began monitoring fires in 1998. Meanwhile, accumulatively from January through September of 2017, there were a total of 195,000 fire outbreaks, which is represents a 51 percent increase compared to 2016.